The RTM 1400 is a self-inflating 80mm thick mattress designed to replace the existing mattress of any 1400mm wide rooftop tent. Its self-inflation/deflation allows for extra storage room of your sleeping gear without interfering with easy pack down. The RTM 1400 features an open cell high density foam that offers a soft comfortable surface with long-serving support and reliability. The open cells allow the foam to absorb, release and control moisture vapour freely and resist the growth of mould. The density level ensures the foam will not break down and creates excellent sound absorption, ruling out the common frustration associated with noisy air mattresses. 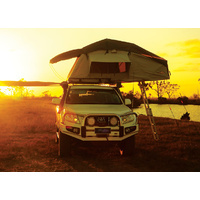 Construction includes a hardwearing yet luxurious 75D peach finished polyester top, providing excellent strength and durability for frequent outdoor camping and 4x4 touring usage. The uniquely machined plain weave continuous filament construction is engineered to ensure this extremely durable and highly resistant to wear-and-tear fabric will not lose its soft handle over its lifetime. Ultimate warmth is provided in this high quality fabric and is ideal for an undisturbed sleep on colder nights. The base of the RTM 1400 features both Velcro strips and dotted non-slip PVC to ensure the mattress remains secured to the base of your rooftop tent throughout the night.